Donald Trump’s first press conference as president-elect, reviewed. Look at My Papers! Look at My Lawyer! 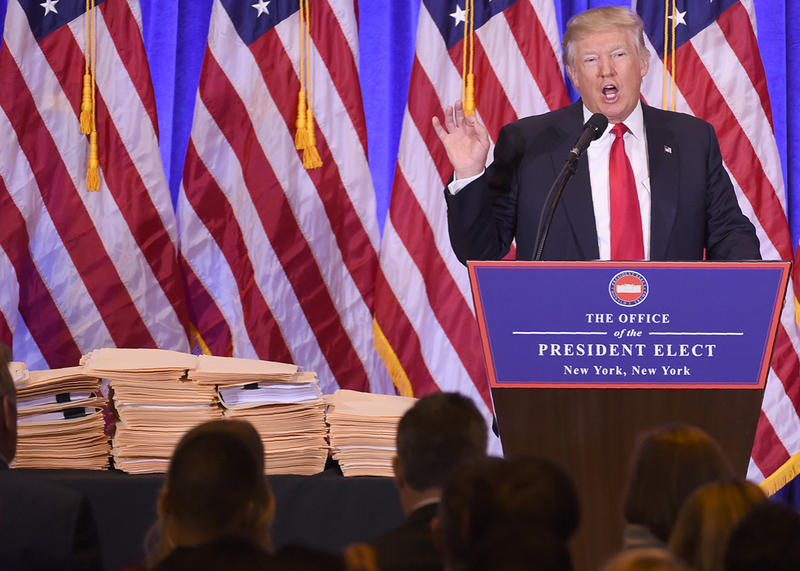 Donald Trump’s first press conference as president-elect featured a big, beautiful pile of props. Props, left, attend a press conference by President-elect Donald Trump, right, on Wednesday in New York. When President-elect Donald Trump emerged Wednesday for his first press conference in almost six months, he did not come alone. The table next to Trump’s lectern groaned with stacks of manila folders. These were “some of the many documents,” Trump explained, “that I’ve signed turning over complete and total control [of the Trump Organization] to my sons.” Those many documents—which were hidden from view by their protective manila armor—were accompanied by a lawyer, Sheri A. Dillon, of the Washington firm Morgan, Lewis & Bockius (recent winner of the Russia Law Firm of the Year award) who spoke in a measured drone that seemed designed to hypnotize viewers into thinking that Trump’s decision not to divest himself completely from his business interests would make America great again. Dillon, dressed in conservative black lace, discussed the various architects of Trump’s nondivestment plan, waving occasionally at those folders—“just some of the paperwork that’s taking care of those actions.” Her role, like that of the sheaves of documents, was to add legitimacy to illegitimate proceedings and perhaps to separate the president-elect from the dull business of forms, clauses, and procedure. “I am a lawyer,” said the lawyer, lawyerlike. Trump, meanwhile, demanded credit for meeting, or appearing to meet, the barest wisp of an obligation, whether by appointing an ethics adviser to his company or promising not to repeal Obamacare without proposing some form of alternative (though he did not specify what shape that alternative might take). The lawyer, with her drab colors and soporific delivery, seemed intent on boring Americans into compliant indifference. Trump was a confident executive eager to get to work. He wore a flag pin and leaned on words such as beautiful, tremendous, terrific, and proud. He even found it in his heart to praise “certain media outlets” for their restraint in not publishing intelligence leaks (while decrying BuzzFeed as a “failing pile of garbage”). Yahoo’s Hunter Walker reported after the press conference that he “asked to look at some of the documents that were piled on the table but I was told I could not because they are ‘company documents.’ ” There is something perfect about Trump’s presentation of a big stack of … something … coupled with the admonition that no one is allowed to look inside. One imagines him showing up to future press conferences with additional objects from the theater storage room. Maybe several large boxes labeled “JOBS” that he can plunk before the camera before ceding the mic to a white-noise machine or a greatness thermometer with which he can measure the country’s success while Mike Pence recites the phone book. Perhaps Trump will be our first prop president: Carrot Top, but less self-aware and more orange. Trump’s children all lined up behind him at Wednesday’s press conference: Ivanka, who will supposedly have no more say in the Trump Corporation, and his sons Eric and Don Jr., who will (so Trump claims) run the show without their father’s input. “I hope at the end of eight years, I’ll come back and say, ‘Oh, you did a good job,’ ” he quipped, eyes twinkling. “Otherwise, if they do a bad job, I’ll say, ‘You’re fired.’ ” President Obama bid farewell to the nation by quoting a principled lawyer’s much-loved line about tolerance from To Kill a Mockingbird. Trump slipped us a lawyer-shaped tablet of Ambien, invoked the catchphrase from his own reality show, and asked us to believe that papers we’re not allowed to read prove he’s the man we should trust to lead our country.